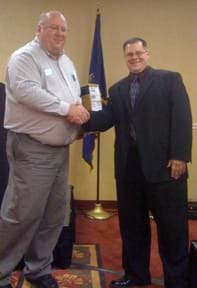 The Lincoln Independent Business Association held their annual membership drive. LIBA now has more than 1200 members across Lincoln and Lancaster County, NE. Dave Bonicatto of Hague Quality Water recruited more new LIBA members than anyone else, wining the the 2008 LIBA Membership Drive. As the top recruiter of 2008, Dave had his choice of many awesome prizes. In the end, Dave selected a new notebook computer from Schrock Innovations – an $899 value. Congratulations Dave! If you have any questions about your new computer, remember that it comes complete with a Schrock Innovations 1 year warranty and a free 90-day subscription to our Schrock Desk remote support system. Have fun with your new notebook!